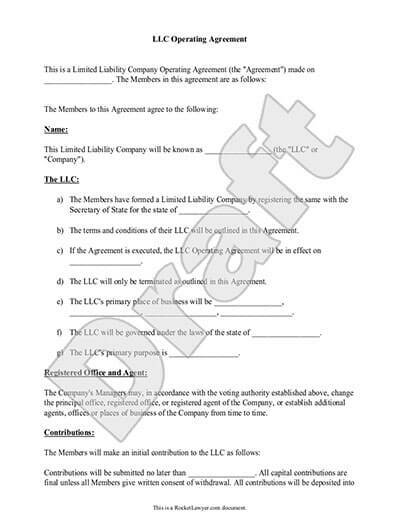 Making your LLC Operating Agreement is an integral part of forming your LLC. This agreement outlines routine activities, describes how disputes are resolved, defines member duties and contributions, and more, to help your business run smoothly and conflict-free. You're currently forming your LLC and want to define operations. You just formed an LLC and need to outline operations. You want to define dispute resolution procedures for your LLC. Your state requires that you submit an LLC Operating Agreement. Operating agreements include a large volume of detailed information. It is a good idea to get some assistance with forming your agreement. We offer help with agreements suitable for any state and we walk you through the process step-by-step. We can also connect you with a lawyer in your area to review your final documents if needed. An LLC Operating Agreement describes the operations of a Limited Liability Company. It outlines the daily operations as well as what happens if a conflict arises or a member needs to leave (by choice or other). Member details such as their duties and contributions are also included in the agreement. One of the main benefits of an Operating Agreement is that it helps outline how disputes are handled before they happen. What do I need to make an LLC Operating Agreement? Our document builder will guide you through the process of making an agreement, but you'll save yourself a lot of time if you do some legwork prior to sitting down and making the document. An Operating Agreement can be lengthy and full of important details, so being organized in advance can help greatly. Plus, you'll need to discuss some of the key topics with other members if applicable. This includes the name of your company, formation date, primary business address, registered agent, business purpose and duration of the contract. Names of members and contact information, member contributions, what happens if a member quits or dies, member responsibilities and voting procedures. If you own a single member LLC, see Single Member Operating Agreement. When the fiscal year will end, how records are kept and details about distribution. How members can elect managers, duties of managers including required meetings, manager compensation, how they can be dismissed, duties and limitations of power. In most cases a Chairman, Secretary and Treasurer are elected by the members. You may also choose Presidents or Vice Presidents. Duties are outlined in this document. Fiduciary means a person held in trust. In this case to the company. This section covers things such as non-competes. Details about how the LLC may be dissolved. Rights of covered persons, such as the release of certain liabilities. Duties of covered persons such as acting on the best behalf of the company and fiduciary duties. How are LLC member duties defined? Members can create any type of rules they want; However, if you do not have an Operating Agreement your members may be subject to whatever the default state laws impose. Most businesses consider similar responsibilities. The first consideration is what portion of the business the member has an "ownership" of, usually defined as a percentage. Often this is proportional to their financial investment into the LLC. You'll also need to define profit and loss distribution in your Operating Agreement. Regarding actual duties, you will need to outline member voting rights and meeting responsibilities. It is also helpful if you figure out in advance how a member can leave the LLC by choice or by death. Even if you are not required by your state, you should define operations and agreements simply for conflict resolution purposes. LLC Operating Agreements when properly formed help businesses avoid common problems such as what happens if there is a dispute about how the business is being run, if a member wants to quit, questions about the distribution of funds, or challenges with competition or non-disclosure issues. Every member should have a copy so that they can refer to it if they have questions about basic operations or what the procedure is for bringing up an issue to the board. State requirements vary. While your state may not require that you have an LLC Operating Agreement in place, at a minimum they will require Articles of Organization, which includes your basic business information. However, even if your state does not require an Operating Agreement you should have one, especially if you have more than one member. If you do not have an agreement in place, your company may be constrained by the default state rules, which may not be beneficial to your company. You may not need to submit your agreement to a state agency, but you'll need it if issues arise. If your company is audited by the IRS, you may need to share your operating and partnership agreements with auditors regardless of what state the business resides in. Are Corporate Bylaws the same as LLC Operating Agreements? For the most part, yes. The difference is that Corporate Bylaws are intended for corporations such as S- or C-Corps. To learn more, see What are Bylaws and do I need them? If you have not yet formed your business entity, we can help you Start an LLC. We can also help you write your Business Plan and executive summary. If you are not sure what type of business you want to form, see Choosing a Business Structure. 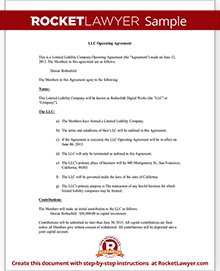 Our step-by-step interview process makes creating a printable LLC Operating Agreement easy.